We are Jim Ritchie A.M.P.A. A.B.I.P.P. & Brenda Ritchie L.M.P.A. and together we are Jim Ritchie Photography. 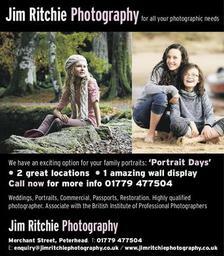 We are a husband and wife team with over 25 years experience in photography. We are qualified with 'The Master Photographers Association' (MPA) and 'The British Institute of Professional Photographers' (BIPP). Jim has recently submitted a panel of his work to The BIPP and gained an Associateship in Social Photography. This qualification recognises a high standard of craftsmanship and creative ability, showing excellence in technique, lighting and composition. Only a small percentage of professional photographers achieve this standard. BIPP qualifications are recognised internationally as a benchmark of excellence.